Peeking above the Rio Tejo, Lisbon’s undulating terrain rises into view, making it a city to be admired from its many viewpoints. Zigzag your way up through the narrow streets from one restaurant to another and marvel at the colorful sprinkling of terracotta rooftops that sprawls into view beneath a radiant canopy of a sea-blue sky. Nestled in the unassuming back streets of Bairro Alto is the Miradouro de Santa Catarina. With an outstanding view of the Rio, this small hub is perfect for overlooking a sunset where the 25th of April Bridge and the Christo-Rei statue stand out like dark shadows against the coral hues. Swing by the Noobai Cafe situated right next to the Miradouro to lounge on the terrace and bask in the smooth rhythm of Bossa Nova while watching the sun bow down over the Rio. For a view that boasts a grand panorama of Lisbon’s famous sights, head to one of its most iconic monuments, the Elevador de Santa Justa. Towering above the streets of Baixa, the Neo-Gothic elevator transports you up to the top for a glimpse of the Castelo de São Jorge that rises above the leafy crown of Alfama, Lisbon’s oldest quarter, directly opposite. 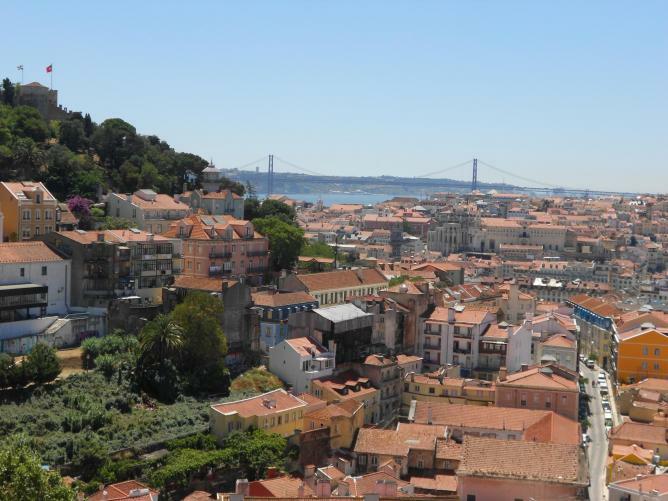 However, if you want to bypass the elevator experience, brave the ascent up Calle Sacremento to Largo do Carmo and follow the bridge to access the viewing terrace. 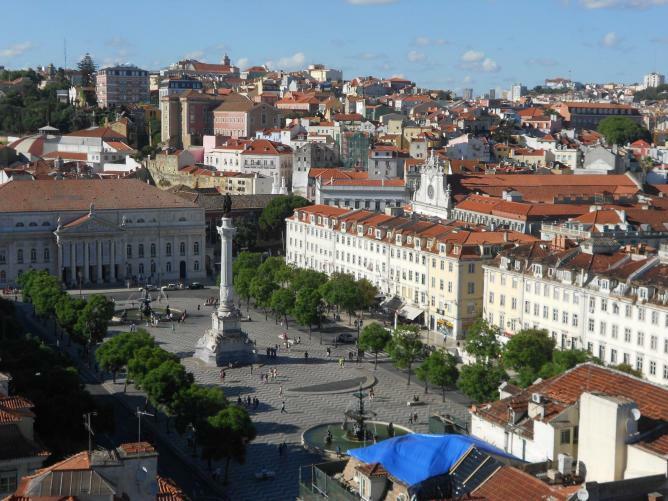 From the open-air summit, the Rossio Square focuses into view as well as the arches of Ruinas do Carmo. With the vintage Tram 28 winding past and the baroque silhouette of Alfama’s skyline arched overhead, the Largo das Portas do Sol encapsulates the beauty of a picturesque postcard. Lying beneath the original Moorish gateway is an undisturbed view of Alfama’s intricate labyrinth of narrow streets and alleys to admire from the balcony. Framing the backdrop of Lisbon’s most scenic pocket of the city is the Monastery of São Vicente de Fora and the Monastery of Santa Engrácia. Clambering through the steep cracks of Alfama in the heat of the day can leave you feeling slightly bleary-eyed, but the Miradouro da Garça blossoms into view as a much-needed oasis. This cobbled square shaded by a leafy umbrella of pine leaves overlooks the concrete hills sweeping across central Lisboa with many of its landmarks floating discreetly in the far distance. Dominating the view on the left-hand side of the neighboring hill is the Castelo de São Jorge. Lounging on the cusp of Bairro Alto and a stone’s throw away from Rossio Square is the superlative of all miradouros in Lisbon. Double-tiered with a landscape garden beneath the upper balcony, the São Pedro de Alcântara miradouro is bustling with local buskers and artists. It’s a haven for sundowners wishing to sip on a glass of something chilled from the upper bar and gaze upon a stack of Alfama against the setting sun. After rattling through the nooks and crannies of Lisbon’s historic center and eventually staggering uphill towards the tranquil quarter of Estrela, disembark the Tram 28 to be dazzled by the 360° vista from the Basílica da Estrela. 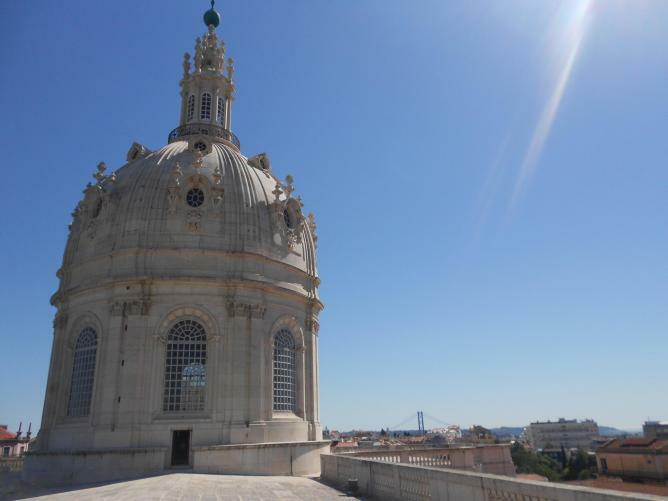 Barely a trickle of tourists meanders up to the sunlit heights of the Basilica’s rooftop and cupola, making it an ideal escape from the crowds to peer below at the sprawling mass of red-rooftops descending towards the river. This restaurant offers enchanting views over Lisbon. 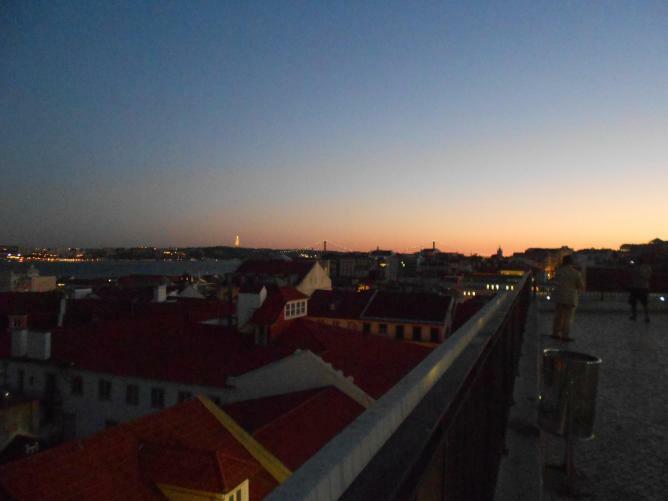 Chapito’s boasts the ultimate dining experience in Lisbon as you enjoy the contemporary Portuguese cuisine and the colorful evening sky simultaneously. Recline in the best seats of the house that overlook the terrace for the most mesmerizing sepia-lit sight of Lisbon and be serenaded by the late fado performances. 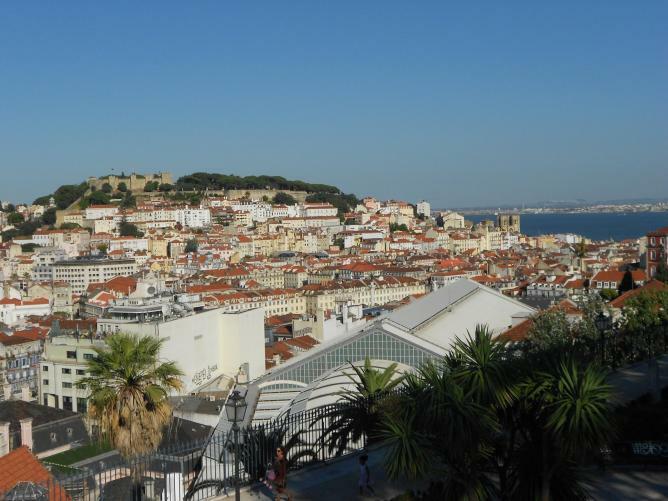 Lisbon’s landscape doesn’t have to be admired from above – the Mercado de Fusão may not be hovering on the edge of a sloping cluster of cobbled streets and pastel-colored houses, but it offers a relaxing spot to peer up at the surrounding views. Dwelling at the foot of Alfama, this ethnically conscious market enshrines bars, world food stalls and plenty of deck chairs to lounge around in during the balmy hours of an afternoon. The Castelo de São Jorge is visible through the draped bunting fluttering above and Latin acoustics oozie from a tepee.